An Athletes’ Village like no other. EarthLodge is nestled in the hills surrounding the stunning colonial town of Antigua. We live above the clouds, we live in the shadow of 3 volcanoes, we live in a place where dinner is regularly haulted by the shouts of ‘lava!’ as we rush out to watch Volcan de Fuego release some pressure, we live in one of the most beautiful, well-equipped lodges on earth. And, we haven’t even mentioned the food or the beautiful yoga studio or avocado farm yet! The cabañas and treehouses of EarthLodge are simply legendary. Each cabaña comes with it’s own en-suite, pumping out hot water, and a view to die for. This is the best accommodation found anywhere on the Impact Marathon Series, and is one of many highlights of the Guatemala race. Exploring your way around the Athlete’s Village to find our wooden cabin is an adventure itself. We have cabins with trees winding up through the middle, to ones that literally have a bed and view (see left! ), that may well be the most romantic spot you’ve ever stayed. For those signing up with another and sharing beds we even have a discount with our Couples Quetzal Camp offer. This is, once more, perfect for couples or those who want a bit of privacy. We have large private tents with a big, warm comfortable bed inside. This is not a ‘roll matt and sleeping bag deal’, it is very much a deluxe camping option where even the canvas has a roof above it. 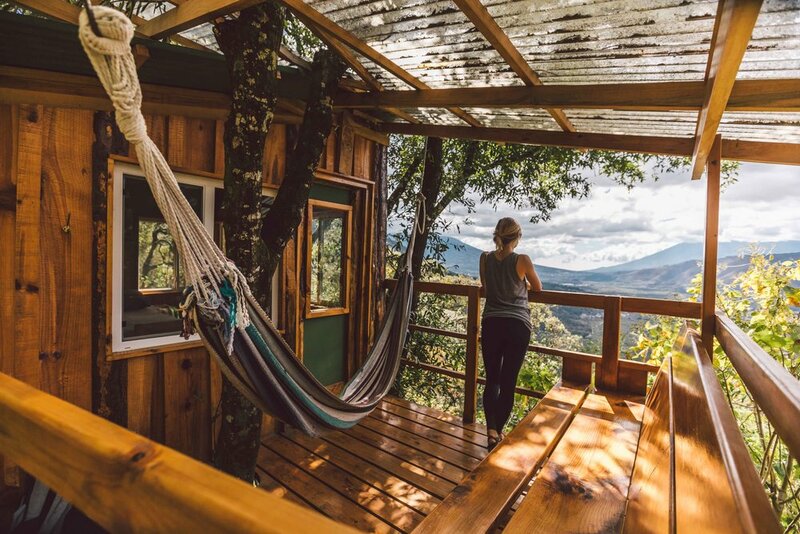 You’ll have immediate access to warm showers, the sauna and all the wonders of living in an Avocado farm overlooking volcanoes..
Our 2nd most popular option! Base Camp fills up very quickly indeed. Our dormitory style room, is a beautiful cabin with super comfy big beds and a lot of friends to be made. Perfect for the solo traveller or a small group of friends alike this is normally where we find a whole load of positive energy and laughter. Very peaceful, very beautiful and with immediate access to warm showers, the sauna (right next door!) and the kind of luxury toilets you don’t expect to the find on the side of a Guatemalan hill. Book fast to grab your bed in Base Camp! Our entry level option for all those who want privacy but on a budget! Pitch up, set your tent up with possible the most beautiful view in the world laid out in front of you and…boom! Welcome to your Guatemala Impact Marathon. You will have access to toilets, showers, sauna, everything. And at night you can retreat to your own personal space, snuggled up…but remember to zip up that tent, it’s not unheard of for our EarthLodge cats and dogs to want to join you in that snuggle!